Scunthorpe analysis: Doncaster Rovers lack confidence and conviction against Iron men - just what has gone wrong? 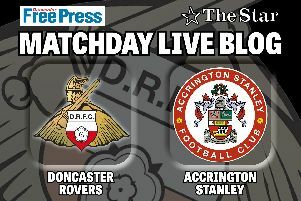 Just what has gone wrong at Doncaster Rovers? That was the pertinent question yet again after streetwise Scunthorpe United nicked a 1-0 win at the Keepmoat Stadium and extended Rovers’ win-less sequence in League One to six games. Rovers have also now failed to score in four of their last five league games, leading boss Darren Ferguson to conclude that “it’s not rocket science” why his side aren’t winning. It’s not just Doncaster’s frontmen to blame though. More on that later. The bigger picture is that Rovers were far from outplayed by Graham Alexander’s well-drilled side. They had more of the ball and more opportunities to score; Andy Williams wasting the best of them after being put in the clear by Tommy Rowe and John Marquis striking the post during Rovers’ best spell of the game immediately after the re-start. They have not been outplayed by anyone this season. But whereas in League Two Rovers might have got away with the odd lapse in concentration, they are being punished in this division. Lee Novak wasn’t picked up properly from a tenth minute corner and headed in what turned out to be the winner. A set piece proved to be Rovers’ undoing at Rochdale last week. And then there was the goal after 24 seconds at Northampton. Similarly, in League Two Rovers’ strikers might have had three or four chances per game and took one of them more often than not. On present form they are now getting one or two opportunities per game, and their conversion rate is not good enough. But that’s not the only thing going wrong. Rovers lacked confidence, conviction and cohesion during a really poor first half display against the Iron. Matty Blair was not able to get forward, Ben Whiteman could not get a grip on things, Rodney Kongolo looked like a fish out of water and Andy Williams and Marquis remained firmly on the fringe of the game. There was a significant improvement following the re-start. But that was also the case at Northampton and Rochdale. Why is it taking 45 minutes for too many players to find their feet? In Rovers’ solitary league win at Blackburn they scored first and then picked off the opposition on the counter to good effect. Conceding first, like they did at Wimbledon, Northampton and again yesterday, is giving Rovers a big problem because it allows the opposition to sit in, reduce space and defend deep. Rovers had some joy getting in behind the Iron during the second half, and Williams should have hit the target with his chance. But their attacking threat was snuffed out almost completely during the first period when there were too many hopeful long balls and not enough care taken in possession. In terms of partnerships, the only constant this season has been centre back duo Andy Butler and Joe Wright. And they both played well again yesterday to limit the Iron to four attempts on goal and two on target. But John Marquis has had three different strike partners already. Niall Mason became the fourth player to play at left back. The midfield has been a three in some games, a four in others. That lack of continuity could be contributing to the disjointedness that was so evident in the first half. There were five changes at Rochdale and another three this weekend. Ferguson is almost caught between a rock and a hard place in trying to find that winning formula.